As rough starts go, the Bulldog soccer team had a significant one Thursday. It took the Class 6A Tigers of Alamogordo just under 20 minutes to compile a 5-0 lead, and they weren’t done there, making it 7-0 by the break. But rather than give in, the ‘Dogs fought back, outmuscling the Tigers in a second half that played out predominantly at midfield and fending off what had once seemed destined to become a quick mercy-rule loss until the final seconds of the game. And while the 10-0 decision left Artesia still seeking its second win of the year, it was another lesson learned for a young squad working to gain as much experience as possible in their final games before district play. With the Tigers using their finesse ball handling to maintain possession for the majority of the game, the ‘Dogs were left with few offensive opportunities. Alamo outshot Artesia 15-3 in the first half and 22-5 in the second. The ‘Dogs stepped up their intensity in the second half, however, to better contest the Tiger forwards. 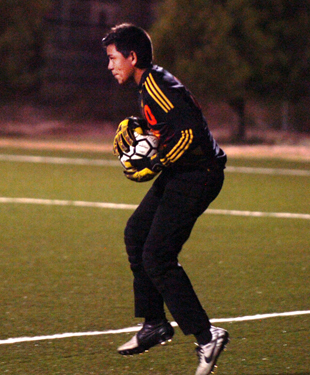 Alamogordo notched its eighth goal just under 10 minutes into the final 40 minutes, but the team would not score again until less than two minutes remained. As such it looked as though the Bulldogs would dodge the mercy-rule margin, but with seconds to go, an unforced mishap in goal gave the Tigers their 10th. Thursday’s loss and a 9-2 defeat against NMMI Tuesday in Roswell place the ‘Dogs at 1-8 as they prepare to head into their final four regular-season games of the year. Artesia will host its Senior Night game against Carlsbad at 6 p.m. Tuesday at The Mack before travelling to Albuquerque Sept. 25-26 for two games at the Sandia Prep tournament. The ‘Dogs will head back north Oct. 3 to take on Moriarty before hosting their District 4-AAAAA opener against Lovington Oct. 6. Despite recent struggles, the Bulldogs are also dedicated to turning things around.